NEW YORK • The announcement of David Bowie's Jan 11 death dealt a double blow. First was its finality. Then came the realisation that barely anybody knew he had been sick, including his old friend, musician Brian Eno, with whom he had traded e-mail a week before. The secret of Bowie's illness countered received wisdom that it is nearly impossible for public figures to hold information about themselves close in an age of 24/7 social media, e-mail leaks and TMZ. Yet, it seems, an increasing number of stars are managing to do just that. In the past year, actress Sandra Bullock kept the adoption of her second child from the world before trumpeting it with an exclusive People magazine cover story. Actress Jamie-Lynn Sigler shielded a 15-year-old multiple sclerosis diagnosis from all but her closest confidants before granting interviews on it last month. Last summer, Caitlyn Jenner not only protected a splashy Vanity Fair cover shoot from ravenous packs of stalkerazzi, she also did not let slip her very name. Actress Angelina Jolie kept to a tight circle her double-mastec- tomy operation until she announced it in an opinion article she wrote for The New York Times. Actress Kerry Washington got married without anyone noticing and writer Nora Ephron held news of her cancer from not only the media, but also many of her closest friends. It is not just pivotal matters of illness, birth and transformation that suggest some stars can, indeed, keep mum in the age of blab. Certain album releases still come as surprises even two years after Beyonce pioneered the insta- release with her self-titled work. To wit: Miley Cyrus kept her collaboration with the Flaming Lips covert until she was ready to abra- cadabra it into computers after an announcement at the end of the MTV Video Music Awards in August. 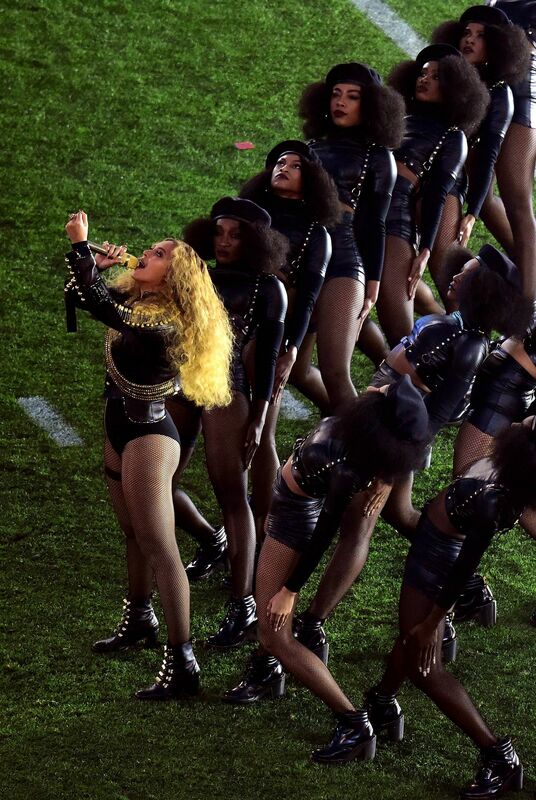 Queen Bey repeated this the day before Super Bowl 50 by flashing her new single Formation. Details of major plot-heavy films can remain cloaked as well. (See Star Wars: The Force Awakens or the forthcoming 10 Cloverfield Lane.) During the past two weeks, comedian-actor Louis C.K. e-mailed his fans a message linking them to a never-announced new Web series titled Horace And Pete. Humour website Funny Or Die created a 50-minute fake biopic, starring Johnny Depp as Donald Trump in The Art Of The Deal, without anyone getting advance notice of Depp's combover take. Film director John Waters has begun writing Mr Know It All, a book that will contain a chapter about stars keeping secrets. In order to do that himself, he declined to talk about the subject. "If writers give away material in quips to the press, we won't have any material left!" he wrote in an e-mail. Ms Liz Rosenberg, a long-time publicist for Madonna, Cher and Stevie Nicks, said: "Stars can definitely still keep secrets, though it's harder these days. You just need to be clever and the people around have to be trustworthy." It also helps to pass out confidentiality agreements. "Whenever we have a high-profile client, we train them that everybody signs an agreement - the maids, the guy who comes in to water the plants, the people who pick up the trash," said Ms Dina LaPolt, a lawyer for Steven Tyler of Aerosmith and other stars. "We put in a liquidated damages clause which says, 'If you breach this, you have to pay us a pre-negotiated fee of X dollars'. It's scary." While entertainment lawyers admit these contracts are not necessarily enforceable, the threat alone makes them effective. As a result, the number of people pressed to sign forms is increasing. Mr George Gilbert, an entertainment lawyer, said non-disclosure agreements have also increased the length of their enforcement periods to protect information not just during the individual's time in the star's employ but also "in perpetuity". Such legal entanglements can actually determine friendships. "A lot of celebrities make their stylists and personal assistants their closest friends because they're not legally able to say anything," said Ms Kathleen Feeley, co-editor of a scholarly study of celebrity gossip, When Private Talk Goes Public: Gossip In American History. The privilege of wealth also insulates the stars. "If you have a beautiful house - it has a bar, a pool and security, you have surround sound and a movie theatre - why go out?" said Marianne Garvey, a former gossip writer for Page Six of the New York Post. "You invite in only people you trust." Meanwhile, the stars get to both circumvent the media and to float an image of utter transparency through their promiscuous use of social media. In fact, that may only obscure them further. "Digital media creates this notion that we can know everything. But it's still a performance. It just creates a false intimacy," said Ms Feeley. "I wish lots of artists would keep more secrets," publicist Ms Rosenberg said. "Once you get too close, it takes away the thrill. When you find out they had the same lunch you did, who wants that?"